Maps are a great way to get to know your watershed. The main watershed map allows you to see the "big picture" and get a sense of the diversity and size of the Lower Sugar River Watershed. 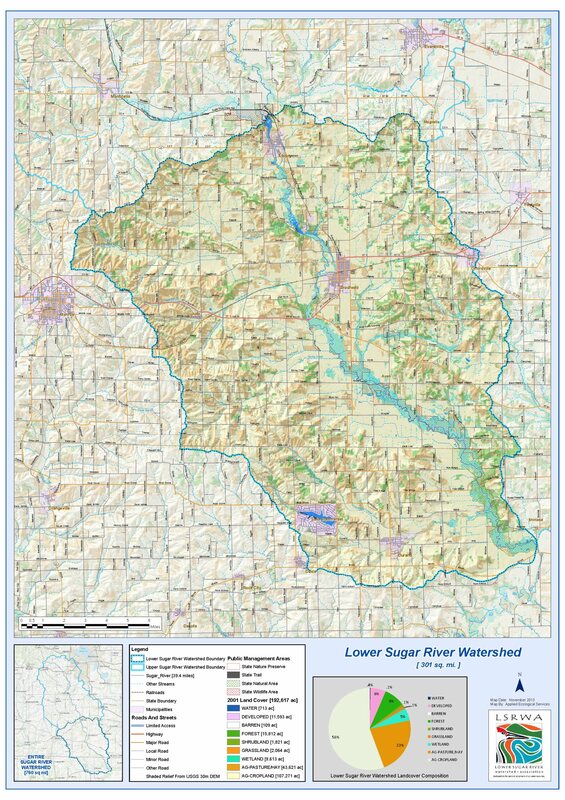 Below are two links to maps of the entire Lower Sugar Sugar Watershed. Our watershed crosses state boundaries, which makes it somewhat unique. Once you've studied the map of the entire watershed, we invite you to explore the subwatershed where you live. This "up-close" glimpse gives you a true sense of what is literally in your own "backyard." Understanding how the subwatersheds are all conntected as the water flows into the Sugar River gives you a clear understanding of how critical it is for all of us to protect the natural resource under our stewardship. We invite you to explore all the maps and then get out into the watershed to experience how the land and water are connected to each other and to the other subwatersheds as they flow into the Sugar River. There are no artifical boundaries like lot lines, roads, and fences in nature. The water flows through farm pastures, along road side ditches, through wetlands, then mysteriously disppears in the middle of the field, and suddenly re-emerges into a beautiful, meandering creek. We are all part of the Watershed. We depend on it for our clean drinking water, for our farms and manufacturing, and for our recreation and leisure activities. Let's enjoy it and use it wisely so future generations can do the same. Please note that some of the map files are large and will take time to load and open in a new window. You may want to download them and open them that way.